There are many mental health effects of alcohol abuse. Many people believe that alcohol has a positive effect on our emotional well-being; that it relieves stress and helps us to sleep. However, in the long term, excessive alcohol use causes a range of mental health issues, from memory loss to depression, suicide and permanent brain damage. In fact, alcohol is a depressant itself!. Our brains rely on a delicate balance of chemicals and processes. Alcohol as a depressant can disrupt that balance thereby affecting our thoughts, feelings and actions. It doesn’t matter what mood you’re in to start with, when high levels of alcohol are involved, instead of pleasurable effects increasing, it’s likely that a negative emotional response will take over. Many people believe that alcohol reduces anxiety, but with excessive use, even just on one occasion, the opposite is actually the case. Have you ever woke up the morning after a heavy night out and as you feel hungover, you feel anxious?. Did you ever worry about what you said or did the night before?. Anxiety is a symptom of alcohol withdrawal, so as the ‘easing’ effects of alcohol wear off, anxiety levels increase. This, in turn, leads to people drinking again to overcome this anxiety. For many, this is where the vicious cycle of alcohol addiction begins. Alcohol is a depressant. Therefore excessive alcohol use can cause depression. If an individual already suffers from depression, the use of alcohol is only going to make depression worse. Unfortunately, many people with depression use alcohol as a coping mechanism. Alongside medication, the recommended treatment for depression is ‘talking therapies’, commonly Cognitive Behavioural Therapy (CBT). This is why residential rehabilitation or alcohol counselling is a good course of treatment for someone who has underlying depression and an alcohol problem. The other problem with alcohol and depression is that people who misuse alcohol often do not take antidepressant medication as prescribed. If they do take the medication, it will not work as effectively as it should because it is not supposed to be taken with alcohol. This only increases the symptoms of depression, which makes such people self-medicate with more alcohol. This vicious cycle can often lead to alcohol dependency. If this sounds like you, you are not alone. There is effective help available to you. Call REHAB HC helpline and we can talk to you about your issues with depression and alcohol. Many people who self-harm and attempt suicide do so when they are under the influence of alcohol due to the combination of feeling extremely depressed and the lowering of inhibitions that alcohol causes. This means people are more likely to do something they wouldn’t normally do when they are sober. 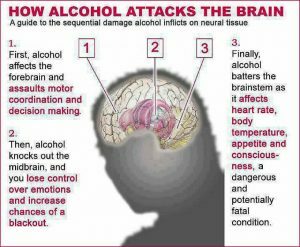 Alcohol dependency can cause brain damage because of the toxic effect it has on the brain and the biological stress of repeated intoxication and withdrawal. These toxins cause brain damage called hepatic encephalopathy explained earlier. Furthermore, excessive alcohol use can lead to vitamin deficiencies. This results from poor diet and excessive vomiting which damages the lining of the stomach from where the body absorbs these nutrients. Most notably, alcoholics suffer from a Thiamine (Vitamin B1) deficiency which can lead to a brain disease called Wernicke-Korsakoff Syndrome (WKS). This disease affects 1 in 8 people with alcoholism and comprises of two disease parts - Wernicke's encephalopathy and Korsakoff's syndrome. abnormal, involuntary jerky eye movements or paralysis of the eye muscles. These symptoms can be reduced if the condition is treated on time with an infusion of vitamin B supplements. If not treated in time, this condition then leads to a permanent brain damage called Korsakoff's syndrome. This condition kills 1 in 5 sufferers; and in 85% of cases, it leads to the second condition called Korsakoff’s Psychosis. While Wernicke’s encephalopathy might be described as the acute form of the Wernicke-Korsakoff syndrome with its sudden onset and rapid development of symptoms, Korsakoff’s psychosis is the chronic form, in that it is not easily or quickly resolved and can continue over a long period of time. The main symptom of Korsakoff’s syndrome is short-term memory loss, particularly relating to things that happened after the condition appeared. However, some people have difficulty recalling information acquired months or even years before. If you are concerned that you or someone you know is suffering from any of the symptoms described above, or that someone you know is dependent on alcohol, we urge you to take action now. Alcohol-related brain damage can be prevented if the use of alcohol is arrested immediately. 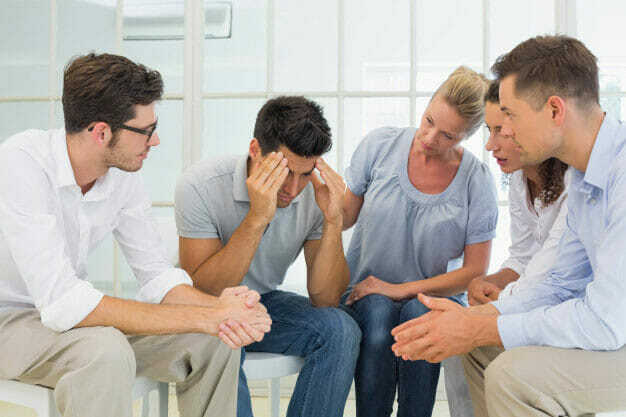 Alcohol detoxification is the recommended treatment for alcohol dependency, followed by an intensive period of rehabilitation to minimise the likelihood of relapse. All of the clinics that Addiction rehab (AR) Helper works with, will prescribe Vitamin B1 (Thiamine) and Vitamin B strong tablets to replace the vitamins lost through excessive alcohol use.